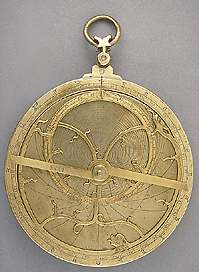 Epact: Astrolabe unsigned, late 14th century ? This instrument is neither signed nor dated, but has some features which make it very likely to be English: the typical y-shaped rete as described by Chaucer, plates only for English towns and the names of English saints on the back. The style of the lettering suggests it to be made in the late 14th or early 15th century.